Coldwell Banker Innovations, the #1 Independently Owned Coldwell Banker Franchise in Maryland and the leading residential brokerage team for the Maryland, Virginia, West Virginia and Pennsylvania regions. With offices in Frederick County and Washington County, we look forward to assisting you as you navigate the wide palette of stunning properties that make these areas such exceptional places to call home. Please Welcome Sara Repp As Our Newest Sales Associate to Coldwell Banker Innovations! Sara has a lifetime of experience in serving people. Even as a child, her parents were pastors of a large church, she learned the importance of serving others. She has led many ministries, from youth groups on overseas ventures of service, to women's conferences, both locally and internationally. She loves to teach and share with others about faith, hope, and love. Her and her husband were marriage counselors for a time, as well as elders at their church. They are both ordained ministers who value the importance of truth and recognize how everyone has a story. They strive to serve people where they are. She has been married for 26 years, and she and her husband have three awesome children, Cortney, Colton and Cylie, who have taught them more about parenting and life than they could have anticipated. Their daughter, Cortney, married a wonderful man, Nathan, and they have a beautiful baby boy, Elias who brings them all great joy. Her time serving her family, her church, and the various schools her children have attended, and all of her community involvement has taught her how to work well with people from different walks of life. She has participated in various volunteer groups, from PTA to singing in nursing homes, to gardening committees, or serving meals at the local shelters,s he has done a little bit of everything. During these years of service she has met many terrific people that have added to her story and have helped her grow. Hiking, gardening or simply watching the hummingbirds play at their feeders are some of her simple pleasures in life. Spending time with family and friends brings her the greatest joy. As her and her husband being to transition into the next phase in their marriage as empty nesters, they thought it was time that she find a new thing to invest in. Being a full time mom has kept her busy, and as rewarding as it has been, she knows she is ready to do the next thing. She is very excited to explore our local area as a real estate agent and become the expert that the client needs to walk with them on the journey of buying that first home, or transitioning out of their current home. She is a good listener and sees potential in every situation, and she believes that will be an asset to her clients. Understanding how intimidating new beginnings are, she hopes to be a source of help and encouragement during what can be an uncertain and overwhelming process. Most of all, her aim in this new adventure is to meet some great people and help them achieve their real estate goals. Committed to Serve! Check out these 4 tips to make your home more energy efficient this year. If your resolution for 2019 includes cutting back on household expenses, making your home more energy efficient should be at the top of your list. You'll find a wide range of products to help decrease your home's energy consumption. Check out these four tops to make your home more energy efficient this year. Harnessing the power of the sun is an easy way to incorporate energy efficiency into your home this year. Rooftop solar panels are becoming more popular and less expensive. Tax incentives can drastically reduce the cost of these systems. Other solar powered options include outdoor lighting. You can choose a variety of lighting options that won't consume any electricity. Solar powered flood lights, pathway lights, garden and porch lights are just a few of the many options available. Many of these lights are also motion censored, making them even more energy efficient. Consider installing a few of these around the outside of your home. The heating and cooling systems of your home are the primary source of energy consumption. Replacing older furnaces with newer energy efficient models is an excellent way to instantly cut down on energy costs. Can't afford the newer option? Considering ordering your furnace filters online with an auto-renewal option. You'll receive a new filter every few months making it easy to change. Doing so can help reduce energy costs as the heating and cooling systems won't have to work as hard to force air through a clogged filter. Having the filters sent directly to your home also makes it more likely that you'll replace them more often. If you live in the city of trees or an area with plenty of shade you may already be living more efficiently than you think. If not so much, an excellent way to add prolonged energy savings to your home is to plant shade trees in the yard. Not only do trees cut down on the amount of heat that hits your home but they can also raise your home's overall value. Trees help the environment by providing more air filtering qualities to the neighborhood. They also provide homes for pollinators and area wildlife. An Auburn University Study concluded that your home's energy costs will be reduced up to 11% by just having a mere 17% of your home shaded by a tree. Planting a few shade trees around your house today is a great investment that will make your home energy efficient for years to come. Many homeowners are choosing to ditch the large water heaters that can take up a good chunk of energy by continuously heating many gallons of water. A Tankless water heater only heats up the water that you immediately use. These smaller water heating systems cust down on the wasted energy of heating water that will need to be reheated later. Both gas and electric powered tankless heaters are available in these on-demand applications. Any of these four tips will save you money and make your home more energy efficient int he new year. Upgrading to a tankless water heater and solar powered lights may cost you up front, but think of the savings you'll see in 2019 and for years to come. Written by: James Witts who is an eco-conscious home improvement writer. He is constantly trying to find new ways to live off the grid while living in a tiny home with his wife, Andie. Published by: Sam Shalom who is the Marketing Coordinator for Coldwell Banker Real Estate. He is Jersey born and bred, and currently resides in Roseland, NJ. He is an avid reader, loves Games of Thrones and ia New York Yankees die-hard. Feeling overwhelmed by the thought of clearing out that closet? Here are some tips and thoughts on how to declutter and organize your home for a fresh start in 2019. The following is a guest post from The Closet Works, Inc.
Each new year is a time for goal-setting and renewal. If you're like so many others out there, you may have set your sights on getting organized in 2019--knowing what you have and where it's located throughout your home, from your bedroom closet to your home office. It seems like a relatively straightforward task--but if it was that easy, wouldn't we all be organized all the time? So many of us get stuck before we truly get started and can't seem to stay organized over time. If you're planning to focus on organization in the new year, here are some tips that will set up for for success. Whether you're planning to declutter your entire house over a weekend or focus on just your master bedroom closet, it's best to determine your process before you start. The best way to start getting organized is to get the full view of what you have by taking everything out of the space, reviewing it and then deciding what stays and what goes. For your closet, you should consider donating items you haven't worn in a year or two and discarding garments that are stained or can't be repaired. Part of the reason many people aren't able to get and stay organized is because they see it as a big project--but it doesn't have to be. If a full-house declutter isn't in the cards for you this week, tackling clutter little by little could be. Creating a checklist that guides you to clean out a different small area each day can help your home feel more organized in just a few weeks. You've got a plan to get organized--now it's up to you to actually do the work. If you're enlisting the help of a professional organizer or a custom closet company, they'll work with you to plan when your custom organization system will be installed. Then, you can work backward to figure out when you need to organize your closet, mudroom, pantry or office. If you're not working with a custom organization company, you've got some more wiggle room. Whatever you do, set a deadline, but be realistic! Create a schedule that includes extra time in case life gets in the way. To help you meet the goal you've set, work without being distracted. That might mean scheduling time to organize a particular room in your house or a specific part of your closet, such as your shoes or accessories. When that time comes, put your phone in another room for distraction--free organizing and start decluttering. You'll be surprised how much you can get done with a just little bit of focused work. When you've finished reviewing your old clothes and sorting them into piles, for example, reward yourself with a short break. The best way to stay organized is to have a place for everything--down to the last bangle bracelet, watch, belt and handbag. And sometimes, the best way to do that is to enlist the help of a custom organization company. The Designers there can take a loot at everything you need to organize and develop a plan for custom organization solutions that meet your needs--and fit all your stuff. Putting a custom solution in place will make storing your things--and finding them when you need them--a little easier. Whether you're moving into a completely new home or just looking to stay organized, following some simple decluttering tips can help you enjoy your spaces more and gain inspiration from them. Senior Manager, Consumer Engagement at Coldwell Banker Real EState L.L.C. In his role he works on all national TV and online advertising initiatives, heads the brands' internal video production as well as a slew of other projects. He's held other roles within the Marketing Department ranging from Previews & Product Development to the day to day management of the coldwellbanker.com redesign. Besides being a marketer, Gustavo is a musician, writer, film & TV buff, avid sports fan, cereal aficionado, traveler, Tumblr and Tweeter. In a seller’s market, buyers frequently find themselves competing for a limited number of available properties for sale. When competing for a home, one thing that can give buyers a distinctive edge is writing a dear seller letter to the homeowners. A dear seller letter is one thing that can give the buyer a distinctive edge in a seller’s market. In Mid-Michigan, like many other parts of the country, listing inventory is low and buyers find themselves competing for a limited number of available properties for sale. When competing for a home, there are many ways to make your offer attractive to the seller. When a seller is reviewing multiple offers on their home that may be very close in price and terms, you want them to feel an emotional connection to you. A well-written dear seller letter can create that connection. You want the seller to know who you are: Start out your letter by introducing yourself and let the seller know who will be living in the house. They might be thrilled to know that you are, for example, recently married, first-time buyers who work in a field like theirs. It’s all about making that personal connection. Tell the seller why you are moving: Helping the seller understand your motivation for buying their house can make a difference too. Sellers might be more motivated to sell the house to a family who is weeks away from the birth of a third child and desperately needs the fourth bedroom their house offers. Explain to the seller why you love the house: Chances are the seller originally purchased the property because, like you, they felt an emotional attachment to the home. Let them know the distinct characteristics that drew you to the house; whether it’s the beautifully remodeled kitchen or the hardwood oak floors they may have painstakingly just refinished. Sellers will appreciate knowing the details that make their home special to you. Use social media to learn a little bit about the sellers: Checkout the seller’s Facebook and LinkedIn profiles to make some connections. If the seller has frequent posts about races they’ve run and you’re a runner too, include that in your letter. For example, you can’t wait to establish a new running route through the beautiful tree-lined streets of the neighborhood. Perhaps you discover on LinkedIn that you and the seller attended the same university; be sure to mention that you’re an alum. You should also remember and mention things about the house that show your common interests like evidence of pets, kids, or hobbies. If you know the seller has a dog and you have one too, be sure to let them know how much you appreciate, for example, the fenced-in back yard that will be perfect for your beloved pet. Compliment, Compliment, Compliment: Lastly, every good dear seller letter should include lots of compliments and seller love letters are no exception. Make sure your letter is full of sincere praise. Did the sellers custom-build the home? Let them know how much you appreciate their design aesthetic. Is the lower level recently finished? Let them know how much your family will enjoy the space. Did you notice a copy of a classic novel on their kid’s nightstand? Mention how, as an English teacher, that impressed you! Everyone needs a little love and home sellers are no different. If you find yourself competing for your dream house, using these tips to write the perfect dear seller letter may give you a edge. It’s also always a good idea to get the help of an experienced real estate professional to help you navigate through the home buying process. Find out what you can expect during the home buying process and learn all the stages of buying a home. It may be a goal you have had since childhood. Perhaps, you have rented for most of your adult life and now want to experience the joys and satisfaction of home ownership. Buying a home is a big step and requires a lot of important decisions along the way. With some advanced planning and research, you can be sure your home purchase is something you feel good about for many years ahead. Here are the basic steps that lead you to a successful transaction. This is different from qualifying for a loan. This is calculating how much of your budget you will devote to your home and how much money you want for other things. For a person who values travel, they can afford more house than they should buy. Some of their money will go toward accommodations on the road or other travel expenses. If you love fishing, boating, or a hobby such as restoring classic cars, factor the required budget for your preferred pastime into your overall household budget. With that in mind, think twice about buying a home the bank says you can afford. You will be happiest in the home that allows you to enjoy life to its fullest. Know your credit score prior to meeting with any loan officers or mortgage brokers. A lower score will result in a higher interest rate and possibly prevent you from qualifying for the loan you want. It can take several months to correct any errors in your report. By reviewing your report a few months before home shopping, you could save yourself several thousands of dollars over the life of your loan. The U.S. Department of Housing and Urban Development (HUD) advises potential home buyers to attend a homeownership education class prior to choosing a mortgage. The Consumer Financial Protection Bureau was established to help protect consumers from predatory lending and mandates all required information about your loan and real estate transaction be written in clear, easy to understand wording. It is an excellent resource for home buyers. Take time to interview several loan professionals before signing with one. You can be pre-qualified by your bank or any loan company. That does not obligate you to choose them for your home loan. Discuss your goals with a Coldwell Banker® brand agent. They are here to consult with you at each step of the process. Also, it is a good idea to know who will be your attorney for the closing. Many builders want you to close the transaction with their attorney. As the home buyer, it is your right to choose the attorney who will represent you in the closing. Once you are pre-qualified, you are ready to begin shopping for your new home. For most buyers who plan to purchase with a standard 30-year fixed-rate mortgage, there are few restrictions on the houses they view. If you will be using a FHA loan, USDA home loan, or other special financing, you can only consider homes that qualify for these programs. HUD has incentives for first-time buyers and community servants like firefighters, teachers, and lawenforcement officers. To see if you qualify for special financing, and to learn if there are any Good Neighbor Next Door homes available in your area, consult with a Coldwell Banker® brand agent. Take your lifestyle and future plans into consideration as you view homes. If you plan to move in a few years, you may want to choose a simple, easily affordable home that will always be in demand and fairly easy to sell. It is best to have a second and third choice in mind that you can go to if you have to walk away from negotiations on your first choice. Buying a home is an emotional experience. Trust your home buying expert with Coldwell Banker Real Estate LLC for guidance. They work with lenders, home sellers, and other real estate agents every day. They will advise you on negotiation strategies and be there to provide objective advice that protects your best interest in the transaction. Most contracts have contingencies, and the negotiation is not complete until all contingencies are met. A thorough home inspection by a certified professional is crucial for any home purchase. You should attend the inspection and feel free to ask questions about any areas of concern. Once you have received the home inspection report, your Coldwell Banker brand agent will review it with you. You may choose to ask the seller to make some needed repairs, negotiate a lower price, or accept the report and move forward with the transaction as it is. The Real Estate Settlement Procedures Act (RESPA) requires that lenders provide home buyers with as accurate of a good faith estimate as possible and that they disclose the nature of all cost. It also prohibits kickbacks and other unlawful payments among real estate professionals and lenders. The TILA-RESPA Integrated Disclosurerule combines forms required by the Truth in Lending Act, also known as Regulation Z, and the Real Estate Procedures Act, known as Regulation X, into one simple form. This new document replaces the final document required by the TILA and the HUD-1. You have three days to review and discuss it with your Coldwell Banker brand agent. For any changes in amounts before or after closing, the lender must provide you with a corrected Closing Disclosure showing the actual amounts. All financial figures must be documented in writing and not delivered verbally. With sufficient communications prior to closing, you know the amount of certified funds (if any) you need to bring to closing. You can relax, sign the necessary paperwork, and receive the keys to your new home. 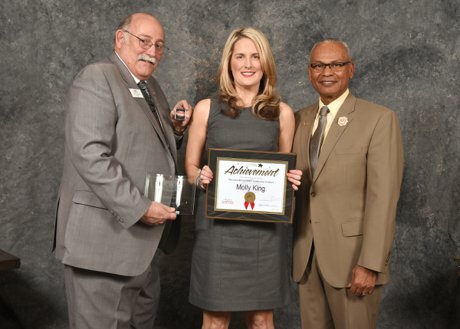 Molly King of Coldwell Banker Innovations and Pen Mar Association of Realtors was one of Twenty graduates from the Maryland Realtors eighteenth annual Leadership Academy honored at ceremonies held in Annapolis. The Maryland REALTORS® Leadership Academy was formed by REALTORS® who understand the important role they play in their community and the need to enhance the leadership skills, knowledge, and competencies of fellow REALTORS interested in making a difference in their personal lives and in their communities. Pen-Mar Association of Realtors, one of sixteen local Realtor Boards in Maryland is a strong advocate and recognizes the importance of this program to Pen-Mar's future. The Maryland REALTORS® Leadership Academy offers an intensive curriculum designed to develop skills in leadership. communications, strategic planning, legislative and government affairs and community involvement. Classes are conducted over 7 months and stress the valve of professional and personal commitment to business, charitable and civic endeavors. "Today we honor you as future leaders in communities and within our REALTOR® organization and thank you for your willingness to step into a leadership role," said 2018 President Boyd Campbell. He added, "you have already achieved so much." David Charron, Bright MLS Chief Strategy Officer addressed the graduates and guests. Charron told the graduates, "the path of leadership is crooked and dormant until it happens...things that don't make sense get disrupted and that's when leaders emerge." The MRIS Investors and REALTORS® Property Recourse (RPR) sponsored the 2017-18 Maryland REALTORS® Leadership Academy event and were recognized for their support.